Israeli soldiers attacked, Friday, many Palestinians, who were trying to enter Jerusalem for Friday prayers in the Al-Aqsa Mosque, in occupied Jerusalem, and injured many of them, including a journalist. The soldiers also abducted a young man near Jenin, in northern West bank. 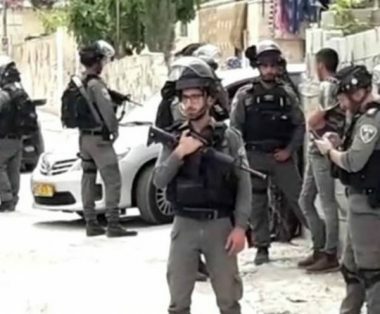 The soldiers attacked the Palestinians in Wad Abu al-Hummus area, near al-Khass and an-No’man villages, east of Bethlehem, and prevented them from entering Jerusalem. Media sources in Bethlehem said the soldiers fired many gas bombs and concussion grenades, causing many Palestinians to suffer the effects of teargas inhalation. They added that the soldiers also shot a journalist, identified as Safiyya Omar, with a concussion grenade in her back. The journalist, who works for Baladna Radio, and the Palestinians who suffered the effects of teargas inhalation, received treatment by local medics. Furthermore, the soldiers invaded Kafr Dan town, west of the northern West Bank city of Jenin, searched homes and abducted a young man, identified as Mohammad Marwan Mer’ey.